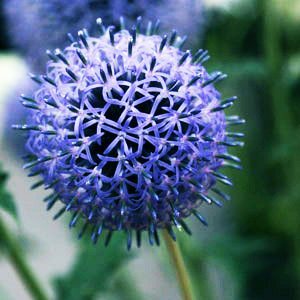 If you want to add some blue to the garden, then Echinops could be the plant for you. Not only blue flowers, Echinops also have wonderful textured foliage as an added attraction. Also known as the ‘Globe Thistle’ it is the rounded flower heads that lend it the common name. Its not that often that we say plants prefer poor soil, however Echinops ritro might be one that copes with it better than others. Ceratinly good drainage is essential. With spiky, electric blue flowers varieties such as Echinops ritro and ‘Taplow Blue’ are popular garden forms and are easy to grow and provide fantastic color in the border. Flowers also last well as cut flowers, and will certainly add interest when used this way. Drought tolerant, fairly disease free and easy to grow. Echinops will die back over winter, a good time to dive them if needed. The blue flowers appear in early spring and are reasonably long lasting. We suggest deadheading as some as the flowers fade a little to prevent self seeding if this this is not desired.